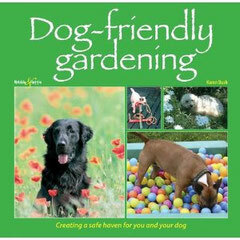 Dog Friendly Gardening - the book! 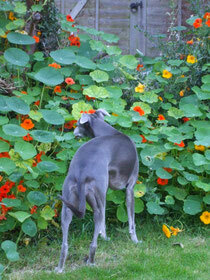 I found there was such a lack of information about creating a dog-friendly garden available in books that I decided to write one myself. In it you'll discover plenty of ideas on ways to make your garden a safe and fun place for you and your dog to share together. Lots of people have generously shared their own tips and experiences, so you'll find it stuffed with pictures and information about real gardens, real dogs, real problems - and practical, effective tried-and-tested solutions. Well, it won't tell you how to garden as there are already plenty of books out there which tell you all about how to dig beds or prune roses. But it will tell you all the important stuff that those books don't cover, about how to garden safely for your dog, solve problems such as escaping, and generally make the most of the space you have so you can both enjoy it together. ... and lots, lots more! Tony with rescue puppies Moomin and George. Pic: courtesy of Sarah Fisher. All this and a foreword too, by the lovely Anthony Head. What more could you want? As well as helping you to create a safer and more enjoyable garden for you and your dog, buying this book will also benefit other animals, as all royalties will be going to help continue the work of Sarah Fisher and Tellington Touch at Tilley Farm. Tilley Farm is a 96 acre farm owned by Sarah and her partner Anthony Head: as well as hosting courses which promote kind, respectful and effective handling techniques for all animals, free of charge to charities, it is also the venue for TTouch Practitioner Training Clinics, and sighthounds from Greyhound Rescue West of England go to the farm once a month to enjoy walks in the countryside and to work with TTouch practitioners who volunteer their services to help these dogs in need. Jon hard at work making a digging pit in the dog friendly garden. Sarah Fisher and Anthony Head support many charities around the UK and in Europe. As education and welfare go hand in hand, Sarah and Tony raise money to assist smalller charities, enabling them to attend the TTouch courses at Tilley Farm. They are also building their own large Dog Friendly Garden in an enclosed area at the farm, giving dogs that cannot be let off the lead access to free running and games in an enriched environment. 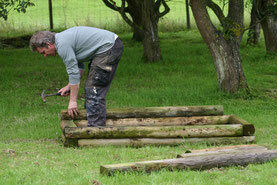 Work has now started on the garden, and regular updates on its progress will be posted on the DFG blog and FB page. Sarah and Tony also foster difficult puppies for Battersea Dogs and Cats Home, giving them the opportunity to overcome their concerns through using TTouch and other positive training techniques. The new Dog Friendly Garden will provide those puppies as well as other canine visitors to the farm with stimulation and an opportunity to explore and learn in a safe environment. You can read more about some of the foster puppies here. Sarah is the UK's leading Tellington TTouch instructor and a behaviour counsellor; she trained with Linda Tellington Jones (see below) and Robyn Hood, and organises the TTouch trainings in the UK. Rescue work is close to her heart and she teaches staff workshops for many of the UK's top animal shelters including Battersea Dogs and Cats Home, the Mayhew Animal Home, Blue Cross, Wood Green Animal Shelter and Dogs Trust, and works with their long stay dogs and other animals with behavioural issues. Sarah also fosters challenging puppies for Battersea Dogs and Cats Home, and has extended her work to include workshops abroad in Poland, Romania and Holland for rescue organisations. 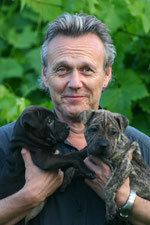 Together with her partner Anthony Head, she has also initiated Cool to be Kind to help promote kindness to animals. 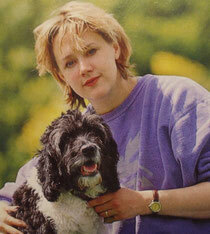 Sarah has been using Tellington TTouch in her work with animals for over 20 years. She explains: "Tellington TTouch is a kind and respectful way of working with animals to help them overcome a variety of health and behavioural issues. It was developed over 30 years ago by Linda Tellington Jones and is now widely used around the world by trainers, shelter workers, vets, physiotherapists, behaviour counsellors, veterinary nurses and owners. TTouch recognises an inextricable link between posture and behaviour and uses bodywork, ground work exercises and specific equipment to release tension and to initiate a feeling of calm and well being. This in turn helps animals develop self confidence and self control, and enables them to move beyond their instinctive, often fearful responses. TTouch can help animals to become confident in all areas of life. Contrary to outdated beliefs, handling a fearful, defensive or reactive animal in a positive, mindful and calm way does not reward and reinforce that behaviour. It can change it. TTouch has a profound and potent effect on the nervous system and has a powerful influence on responses and mood. A dog which suffers from noise sensitivity or noise phobia for example, is likely to carry tension through the hindquarters and tail and may dislike contact on or around his paws. His lower legs, tail and ears may also feel cold. By using the non-invasive body movements (TTouches) the circulation can be improved, warming up cold extremities, relaxing tight muscles and releasing habitual patterns of bracing. 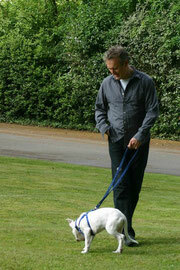 They can also induce calm and change the dog's expectations of what contact around his paws may mean. Stroking the ears using Ear Slides will help to lower the heart rate and respiration, and putting a bodywrap or Tshirt on the dog can also help to give noise sensitive dogs a sense of security, often reducing their need to den. As behaviours are usually linked, dogs with this pattern of tension through the body may also be nervous in new situations, be wary of strangers and find travel difficult. Even well established patterns of behaviour often alter within a very short space of time and TTouch has saved the lives of many animals whose behaviour has been deemed to be out of control." Even if your pet doesn't have a problem as such, using TTouch bodywork is a wonderful way of helping to create and deepen the bond between you and your dog, and can be as rewarding and relaxing for the giver as for the receiver. It will also help you to become more familiar with your dog's body, so treating him to regular sessions of bodywork can alert you early on to any changes which may be indicative of the onset of a problem. . . . . . . . . . . . . .Top TTouch Tip . . . . . . . . . . . . . .
"Contact with the back of the hand is often less threatening to a nervous dog, and it is also an ideal way of teaching children how to interact with the family pet. Stroking with the back of the hand prevents them from patting or leaning on the dog which can be threatening for many animals."